There is a 13 acre apricot orchard located about a mile from my house and every March there is a Mustard Festival where people are invited to come and harvest the mustard plants that are grown amongst the trees. When the flowers are in full bloom, it is really beautiful and makes me think of Napa Valley and all the vineyards planted with mustard. 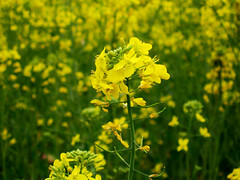 The reason why vineyards and orchards plant mustard is to keep the weeds under control, but also to help stimulate the soil for the upcoming growing season. And of course because it's beautiful! I love visiting produce farms, orchards, vineyards and farmers markets, learning how plants and produce grow. When we purchase food in the grocery store, it is so prepped and over processed that half the time we have no idea what it looked like in its natural form. I mean who would of thought that this beautiful flowering weed could produce thousands of tiny pungent seeds used in cuisines all over the world, and end up in a jar in the spice section. Pretty amazing actually. Spring has finally arrived and all the mustard seeds have been harvested and so I decided to make Roasted Baby Potatoes with Mustard and Coriander. This dish uses just about every form of mustard, except of course, yellow table mustard. I served these potatoes with a Chickpea Curry, but you could also serve these as a side dish with your favorite vegan burger, topped with a spicy curry-mango aioli. Sounds yummy! Rinse potatoes and pat dry. Cut into quarters or in half if small. 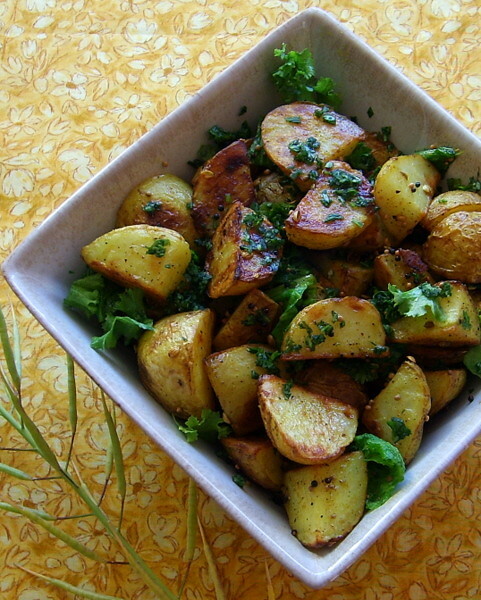 In a bowl, toss potatoes with 1 tbsp extra virgin olive oil and sprinkle with salt and pepper. Roast potatoes in the oven for 10 minutes, toss with a spatula and return to the oven for another 10 minutes or so until crispy and golden brown. While the potatoes are roasting, in a saute pan, heat 1 tbsp olive oil and the mustard oil on medium heat, add spices and cook just until spices are fragrant and starting to sizzle. Add mustard greens and heat just until slightly wilted, then remove pan from heat. Remove the potatoes from the oven and place in a large bowl and immediately add spices and toss until combined. Season with salt and pepper to taste and drizzle with remaining olive oil and cilantro.